The game's colorful splash screen. 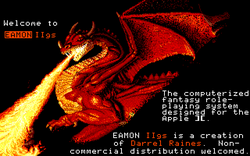 Eamon IIgs is a version of Eamon created by Darrel Raines for the Apple IIGS. Though it never grew into a complete system, Raines did create a "tech demo" to showcase its revised interface and use of graphics. This page was last edited on 24 February 2018, at 07:13.